After chatting rooms, watersports and the food at the Mark Warner Lemnos Beach Resort in Post One, it’s now time to delve into the beach, the local town, and the debrief on what we thought of our holiday all in all. Having island hopped around Greece for two months during one summer whilst at university, I have a real nostalgic love for a Greek beach. Lemnos did not let me down. Hop over the small road from the Lemnos Beach Resort and your feet are in the sand. It’s a mostly sandy beach with a bit of shingle. The sea is characteristically Greek – crystal clear, refreshingly cool, but not freezing. The protection of the bay makes for very calm waters, perfect for little ones. I love a sunset (who doesn’t?). As just mentioned, Lemnos Beach Resort is positioned in a bay, which really gives an air of seclusion, amplified all the more when the sun begins it’s descent. During the summer months, the sunset coincides very nicely with the evening meal on the outside terrace overlooking the bay. One of my favourite parts of our holiday was watching the sky fill with that warm, orange glow every night as the sun set. That hour every evening really defines the Lemnos Beach Resort, for me. As a photography lover, there was more than one occasion when I was itching to interrupt my dinner to head down to the beach for a sunset photoshoot. But realistic thinking kicked in every time as it occured to me that facing the consequences of Arlo missing even five minutes of film club was too much for me to even contemplate. Over the years of trying to coax my children to be happy in front of the camera, or at least just look in the right direction without pulling a grump face, I have learnt that overdoing it is the absolute worst thing I can do. If the shot isn’t how I imagined it in my head, we don’t try again. These days, I also make a point of only getting my camera out for a short burst. All family members are happy with the camera if they trust that it’s not going to take too long or become a chore. And, also, some things are worth being present in the moment for, not experiencing it through a lens. So I bided my time, deciding to take just one sunset stroll, when everyone was in good spirits. Sam took some happy photos of me and the boys that I really like. We didn’t manage a full family photo, or anything particularly aesthetically inspiring, but let me tell you, if I had more time (and compliant children or some sort of chocolate bribery), this is THE perfect place for gorgeous, golden beach photos. Lemnos beach, you are a dream. Oh yes, the vital info that everyone is dying to know. Fear not, here is the lowdown on the peak summer holiday sunbed situation at the Lemnos Beach Resort. Poolside sun loungers were the most in demand, with rarely a free lounger to be found. You don’t have to get up at the crack of dawn to reserve your space, though. A towel drop just before breakfast or heading there straight after Mini Club drop-off worked fine for us. We generally chose to spend our time down at the beach, where there are a larger amount of sun loungers and almost always a couple of spare ones to be found. If the kids fancied a mid-afternoon swim (which they usually did), we’d base ourselves at the poolside bar tables, or spend that time in the water with them. Our days fell into an easy routine of a relaxed morning at the beach or doing watersports whilst the children were at their kids clubs, and an afternoon playing with the children on the beach or by the pool, with a bit of quiet time thrown in. There are no worries about feeling stifled in a resort bubble at Mark Warner in Lemnos. Daily car hire or longer was very reasonable, and all easily arranged at reception. Taxis are also very easily organised – our taxi trip to and from Myrina was seamless. Myrina is a little port town just ten minutes drive from Lemnos Beach Resort. It is the perfect place for a morning or early evening potter (the shops close during the hottest point of the day). If you are feeling energetic, you can walk to the castle at top of the hill which gives great views (or so I’m imagining – we clearly weren’t feeling that energetic on our visit). Myrina is a very pretty, traditional Greek town, with lots of picturesque waterfront restaurants – perfect if you fancy something a bit special one night, or just a change from the resort buffet. Arlo and Rory loved looking at all the boats during our visit to Myrina. You can see a little more of the town in our video. It is very easy to be thoroughly enamoured with a holiday that gave us so many memories. Not to mention an incredibly easy week with our young children. And all on a holiday that we didn’t have to make a carefully considered decision about choosing to book after saving all year for that all-important family break. 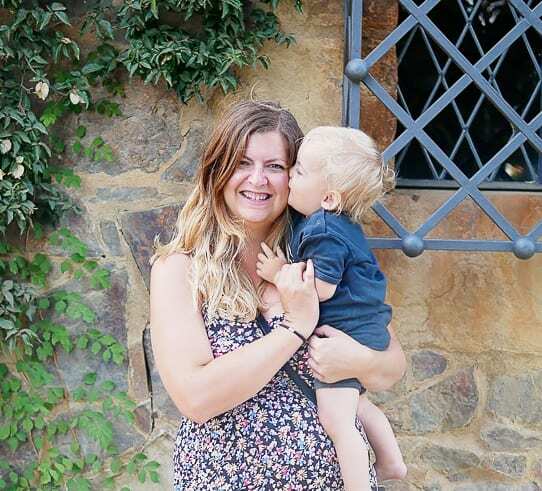 Of course, Sam and I have had several evaluative conversations about our Mark Warner stay, and I want to share the outcome of our conversations here, as I know how vital it is to feel absolutely confident in your decision to book a family holiday. In all honesty, I could find nothing intrinsic about the resort that we didn’t like. We left very impressed with Mark Warner, particularly the quality and friendliness of the childcare team, and the way the watersports are run. However, there were a few considerations about the nature of staying in an all-inclusive resort in general. Sam LOVES cooking, and a large enjoyment of all his holiday experiences to date have involved perusing the local food shops and markets, planning his own meals, and barbecuing with a beer in hand. For Sam, it will always feel unnatural to not have that control over his holiday food, no matter how enjoyable the buffet is. On the one hand, Sam felt somewhat hemmed in by a different activity/event every two hours (WELCOME TO LIFE WITH YOUNG CHILDREN). On the other hand, both of us had a case of ‘not enough time to experience everything’-itis. When we discussed forgoing the on-site activities for a day and hiring a car to explore the island, Sam was reluctant to miss out on a morning of watersports activities (he wanted to have another go at windsurfing) and neither of us would dare to deny the kids their beloved kids club time. In a perfect world, Sam would have preferred to dictate his own routine and meal times a bit more, whilst I would have loved to explore a bit more of island life. Of course, this is all more than easy to do on a Mark Warner holiday, the routine is as flexible as you want it to be – it’s just that with one week, you put yourself under more pressure to experience it all, make the most of the watersports, activities, and kids clubs on offer. That’s the reason you’ve chosen to holiday with Mark Warner, after all. With a two week stay, taking a day out to explore the island, or having an evening meal at a local restaurant in Myrina wouldn’t feel as much of a sacrifice of your time on-resort. Sam travels a lot with work. Hotel buffets have become part of his usual work life. He also spends a considerable amount of time away from the children, or, in other words, I spend a considerable amount of time being the sole carer for the children. Our different day-to-day roles mean that we sometimes see things in different ways. Which is why some of the things that Sam cast his critical eye over in regards to a resort holiday were exactly the same things that I LOVED about our Mark Warner holiday. The simple fact of being able to enjoy THREE WHOLE HOURS of child-free time on a sun lounger by the beach is not as momentous to Sam is it is for me. I REALLY clung onto my guaranteed relaxing beach time. I had time to myself every . single . morning during our holiday. Bliss. At home, if Sam is cooking, I’m putting the children to bed – the buffet and the kids evening movie club gave Sam and I so much more time together. Just to sit and talk without having to divide our time between various duties. Having a different, easier, routine on holiday is what makes it a break from your life at home and a chance to recharge. I’ve never felt so relaxed when we’ve gone away with the children before. Ever. I was literally grinning from ear to ear about being able to ‘have it all’ on a holiday with young children. Ultimately, just like many parents, Sam’s main drive in life is to do everything conceivably possible to have a happy family. He also often talks about his sadness when he misses a weekend at home. About wanting to spend quality time with the children before they grow up in front of our eyes. Our Mark Warner holiday gave him both of these things in abundance. Everything was simple, everything was easy, everyone was happy. We’d do it again in a heartbeat. This sounds so so perfect. The final few paragraphs resonate with me hugely – desperate for that perfect blend of me time, quality grown-up time with my husband and enjoying holiday with our toddler. Ten days till we are there!! One question: do you think walking to Myrina with a buggy is possible, or a silly idea? Is it about two miles? I use a buggy to walk my toddler a mile and a half to nursery each way every day, so the distance doesn’t faze me – but poor quality super hilly roads would! It is possible to walk. You have to go round the headland a bit so it’s a hill up and a hill down (but not hugely steep). Part of the way you will be walking in the road but nearer the Myrina side there is a pavement. It is about two miles. I’d say the main thing would be the heat – you’d need plenty of water and probably be walking at a slower pace that usual. Thanks! I think we’ll give it a go… so excited!!! I was wondering how you got on! Thanks so much for coming back to let me know about your trip : ) Glad you loved it, and sounds like you got a well deserved rest.